I made my way back across the country to Kansas for the final two rounds of the Nauti Water Racing tour in Pomona, Kansas. 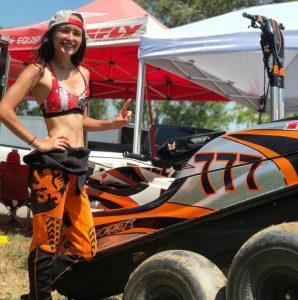 With a busy schedule at Galfer USA and poor air quality in Carson City from the wildfires, it’s been a tough few weeks of training for me, so I was worried about how I would do at the final two rounds. Thankfully, the Boss Man had my equipment on point. We spent a little time fine-tuning my skis over the weekend but my ride was flying and helped me go for a four-moto sweep in my class. The track was big and the laps were long, making for great practice before the world championships this fall. Unfortunately, my trip was short — I hopped back on a plane to Carson City just after the races so I could head back to Galfer USA and prep for Moto America in Sonoma this weekend!